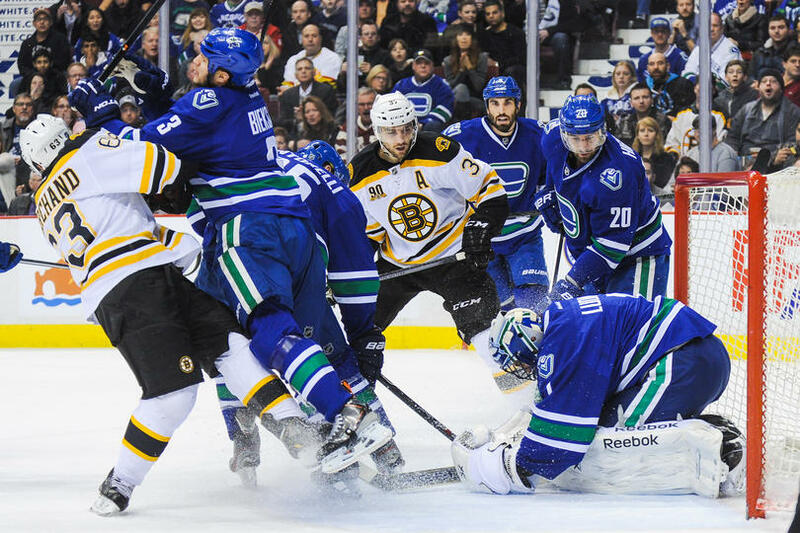 Remember when the Canucks met the Boston Bruins last time in December? Remember how good they looked in beating them 6-2 at Rogers Arena? As good as the Canucks were that night, they’ve been far from outstanding since then. Since scoring 6 goals that night, they’ve scored just 42 goals in 22 games – for those counting at home, that’s a 1.91 goals per game average over an entire quarter of a season. They were shut out by the Detroit Red Wings last night – the third time they’ve been shut out in the last 11 games – and they’ve now lost 4 games in a row. Or more importantly, they’ve only won 4 games since the calendar turned to 2014. On the other hand, the Bruins seem to be doing okay. They’ve won 3 of their last 4 games, and don’t seem to have a problem finding the back of the net; their 3 wins were by scores of 6-3, 6-2 and 4-0. If there are any silver linings in the Canucks’ recent play, it’s that Eddie Lack and Roberto Luongo have consistently shown up and given their team at least a chance to stay in games. Eddie Lack has been great. Last night against the Red Wings, he made 28 saves on 29 shots, many of them of the sensational variety. In his last 6 starts, he’s allowed just 1 goal in 4 of them; but in perhaps what typifies the Canucks’ offensive woes right now, they somehow managed to win just 1 of those 4 games. After Lack started the last two games, Roberto Luongo will be back in net tonight. His save percentage (0.920) and GAA (2.30) this season are still among the top of the league. He stopped 41 of 43 shots against the Bruins in December; however, he hasn’t played in Boston since the 2011 Stanley Cup Finals. For those of you who have repressed those memories already, Lu gave up 15 goals on 66 shots and was pulled twice in 3 starts. The objects in your rear view mirror are closer than they appear. As the Canucks continue to struggle, their grasp on the final wild card playoff spot in the Western Conference is also weakening. After last night’s game, they’re a single point ahead of the 9th place Phoenix Coyotes, who, by the way, hold two games in hand over the Canucks. They’re also only 4 points up on the Dallas Stars, Nashville Predators and Winnipeg Jets, who are all tied with 59 points and currently hold 10th, 11th and 12th place, respectively, in the Western Conference.